The all new Creedence seating collection from Woodstock Marketing is now available! 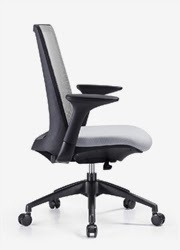 These awesome new office chairs offer a ton of great benefits for both comfort and style. In today's post we'll take an in-depth look at the Creedence collection. Enjoy! The out of this world modern design characteristics of the Creedence seating collection will draw you in, even at first glance! These trendy new chairs feature sleek curves, elegant lines, and a contemporary feel that will no doubt make your workspace pop. The Creedence chair is available in both mesh and leather options. We give these new office chairs an A+ for style! Woodstock Marketing is known for their retro inspired chairs, but the Creedence has taken them into the modern age of ergonomic seating. These comfortable ergonomic task chairs for everyday use offer a wide range of adjustable features that include an advanced syncro weight activated mechanism for tilt tensions, as well as a multi position tilt lock feature and adjustable arms. The Creedence chair is ready and willing to quickly adapt to suit your personal operating needs. For taller users, Woodstock has made an optional headrest available for even further support. 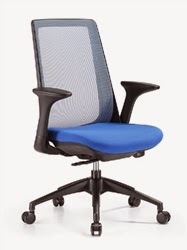 Creedence office chairs are available in a variety of cool color options. Our personal favorite is the blue mesh Creedence chair. If you're looking to add a splash of color to your office interiors, this is the way to go! For a more traditional look, an all black mesh Creedence variation is available along with a gray and black two tone option. If you're going for that upscale executive look, the leather Creedence chair is an excellent option. That being said, we expect the all gray Creedence chair to be the most popular. This year office chairs with gray upholstery have been trending in a major way, and the Creedence is set to capitalize on this growing movement. No matter your decor needs and preferences, rest assured there is a Creedence chair available for you! There's not much the Creedence chair can't do! Use an adjustable task chair from the Creedence collection to meet your workplace computing needs in style. Update your executive office with the all leather Creedence chair and improve functionality and support. We feel based on price, style, and adjustment capabilities that the Creedence also makes a nice addition to professional meeting areas. 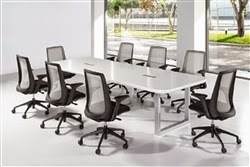 These chairs will keep your valued guests comfortable during boardroom strategy sessions, without breaking your budget! 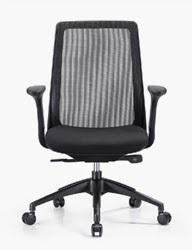 Priced at just $329.00, the mesh office chairs from the Creedence collection are an excellent value. A matching mesh headrest can be added for an additional $69.00. At this price point, the Creedence is extremely competitive with comparable chairs on the market. The full leather Creedence chair is a bit more expensive at $459.00. That being said, the rich upholstery and polished base make leather Creedence chair far more luxurious. Whether you're looking to outfit private work spaces, conference rooms, or executive office interiors, Creedence chairs are ready to help without costing you a fortune. 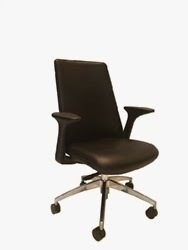 The style characteristics and ergonomic features make these cutting edge chairs a great buy in 2015. We give the new Creedence chair an A+. Woodstock Marketing has really raised the bar with these new chairs. The Creedence follows the latest seating trends and provides the ergonomic features needed for users to reach peak performance levels in the workplace. The Creedence is versatile, comfortable, and cool! If you're on the hunt for a new office chair, give the Creedence a try. You'll be glad you did!